Young people have questions. God’s Word has answers. That’s why Scripture is the heart of each session. The young people who attend will examine what the Bible says, learn what it means, and see how it relates to their lives. …questions does the Bible answer? A good question has remarkable power to stimulate and engage critical thinking skills. Each session of So What? zeros in on one question and one answer, allowing people to focus on the truth in Scripture. …what difference does it make? The question “So What?” captures in a nutshell this study groups primary purpose: that God the Holy Spirit will work through the study of his Word to bring about a person’s ownership of their faith in Jesus Christ. 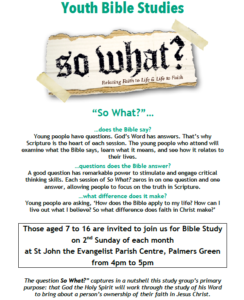 Those aged 7 to 16 are invited to join us for Bible Study on the 2nd Sunday of each month at St John the Evangelist Parish Centre, Palmers Green from 4pm to 5pm.